It is an elegant design & has a pretty high spouse approval factor. It also sounds really good. These designe are great example of many design threads/ideas coming together in a single box. One of the major assets of an onken enclosure is the way the vents acted as a an incredibly well braced, almost constrained layer, cabinet wall -- this was the 1st thing i realized on seeing my 1st onken in an Audax project pamplet in the late 70s (the design actually goes back to the Jensen UltraFlex). 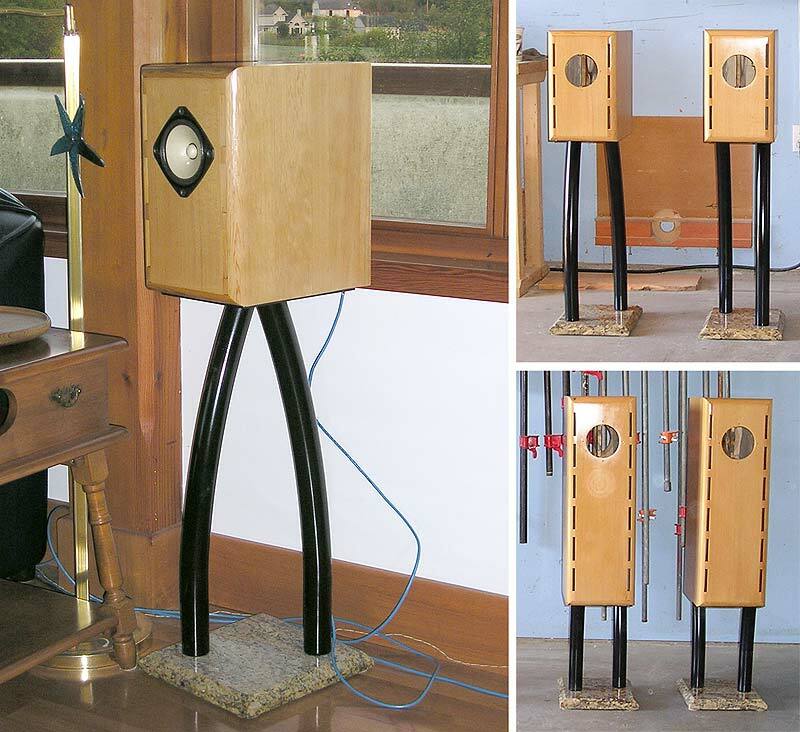 Exposure to Bill Perkin's PR-1 research & Bud Fried's Model R & Q (and the classic Dynaco A25) showed the benefits of aperiodic enclosures. One of these benefits is the way an aperiodic box can help to deal with T/S parameters being curves not scalars -- as drive changes T/S parameters change meaning a typical BR box is only optimally tuned for 1 volume level. My favourite page in Olson's Acoustics is the one with the graphs that show the affect of box shape on diffraction and from this that a box with heavily champhered edges gets you most of the way with little effort. Since we are also playing with small tube amplifiers (2-10W) we wondered whether the much more efficient Fostex FE127e would fit in a miniOnken-like enclosure. Turns out that except for some changes in the size of the port spacers it works really well. 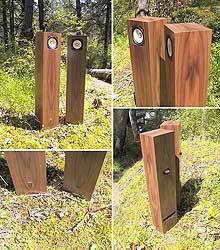 The Fonken & miniOnken are near aperiodic enclosures that provides balanced response from about 60 Hz up to over 15k Hz with no crossovers. The long ports with a very high aspect ratio naturally provide a port with high resistance. 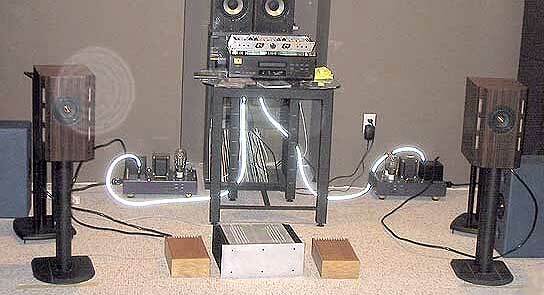 They can be made fully aperiodic with the addition of foam plugs in the ports. This may be useful to easier mate with a woofer -- or in the case of the miniOnken lean out the bass in a room where it is otherwise overfull. The near-aperiodic nature is seen in the Fonken impedance curves below -- it is indicated by the small peak on the lower side of the resoance saddle. 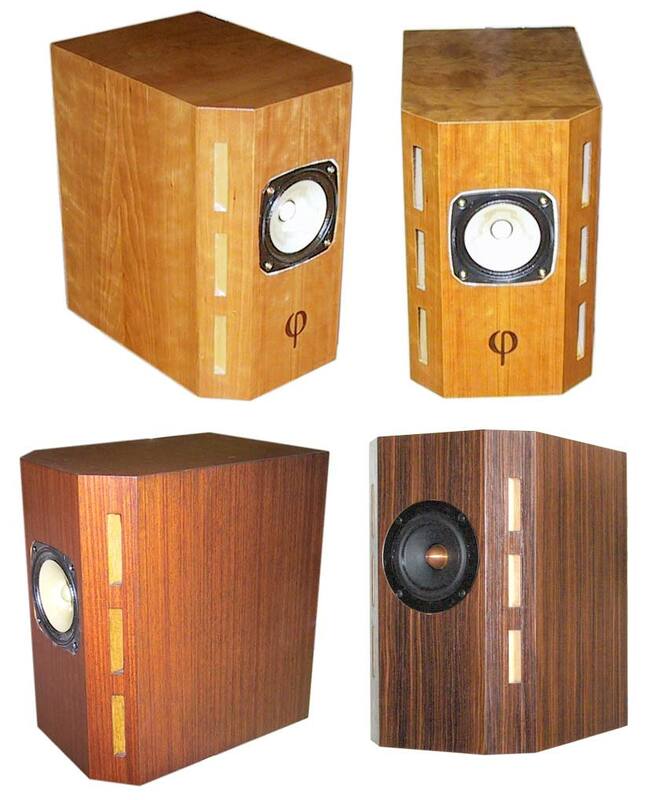 The box structure is quite inert to box-wall resonance induced colourations. Instead of brute-force, the frequency of panel resonances is pushed up to where they are unlikely to ever be excited -- effectively eliminating them. This is accomplished by the use of small panels (no box wall has a greater unbraced panel span than 5" (250mm)), the use of relatively thin, light, and stiff baltic birch plywood, and the driver braced against a large portion of the mass of the box panel to spread that energy as thin as possible. 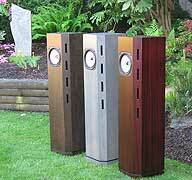 The sonic character of these two speakers are different. Each plays to a somewhat different strengths. 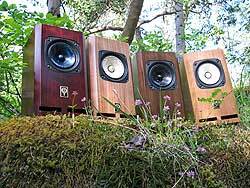 Which one fits your needs best might well be determined by what kind of amplidier you have -- amplifier & speaker should always be consider as a system. Consider the following. The Fonken likes small amps with highish output impedance like SETs, no-feedback push-pull. 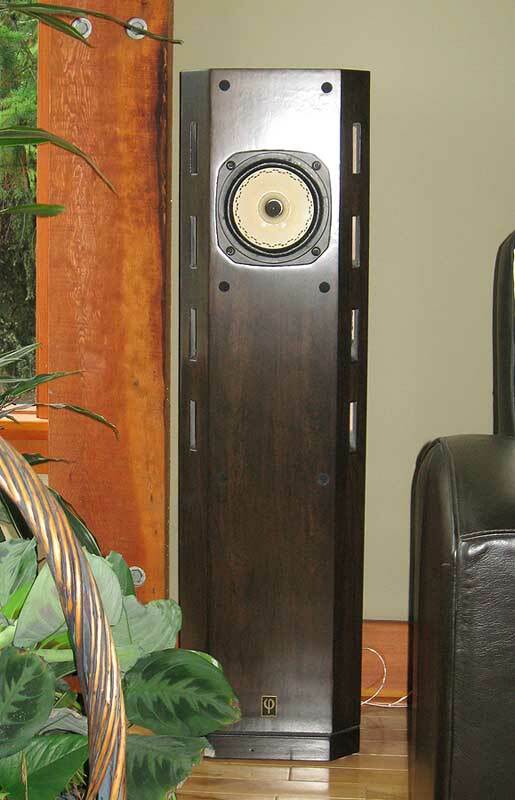 a whole new wave of single-ended SS, and the new small digital amplifiers. 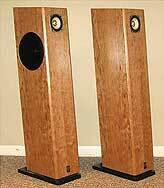 Becuase they are ~6 dB more efficient you can get away with not much power -- 2-20 watts is fine. 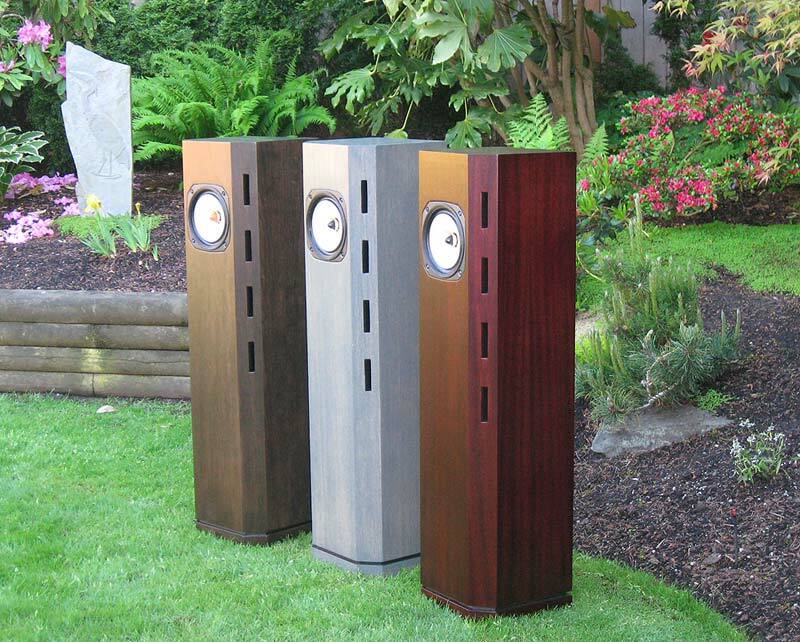 The miniOnken likes larger class A & Class AB PP amps with low output impedance -- typical receivers & solid state amplifiers as well as push-pull tubes amp with feedback. Because of its very flat frequency response it makes a good small control monitor for music or video editing. Suggest 15-50 watts. 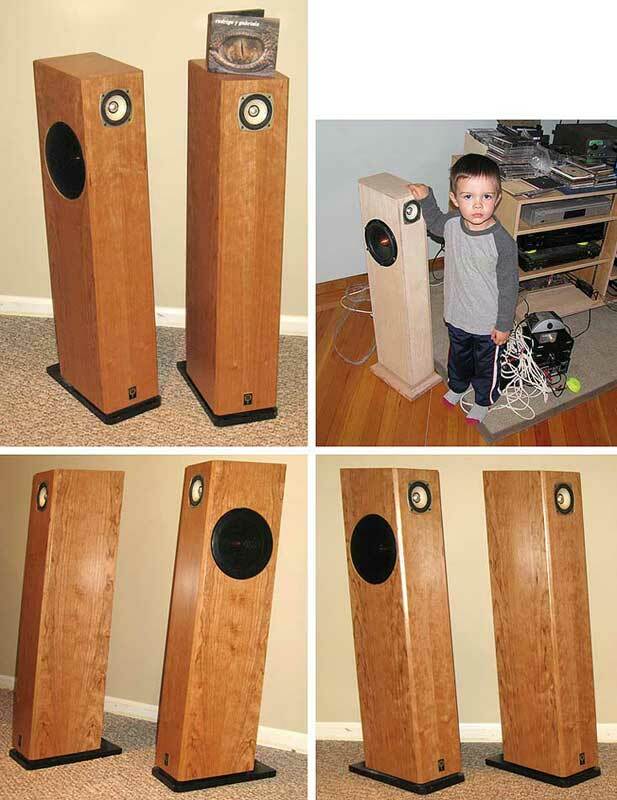 For greater levels & wide soundfield you could start with a set of BiFonkens or Bipoler miniOnkens or these can be used to provide excellent extended midrange with the addition of a woofer & super-tweeter. The advent of home theatre has made the sub-woofer an accepted piece of kit and even a modest tweeter can give more than acceptable performance if crossed over in the 12-20k range you'd need - and the crossover can be a single capacitor. 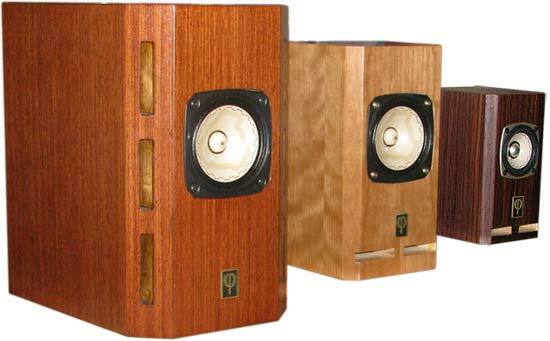 The bipolar versions are only one of a number of other enclosures that have evolved from the original speaker/bass tuning concept. These serve different sets of user needs. 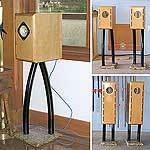 A Fonken floor-stander and for a simpiler to build rectangular box with classic golden ratio proportions have been developed & built. Even more far-out versions have been proposed1. Plans linked are freely available for non-commercial use only. 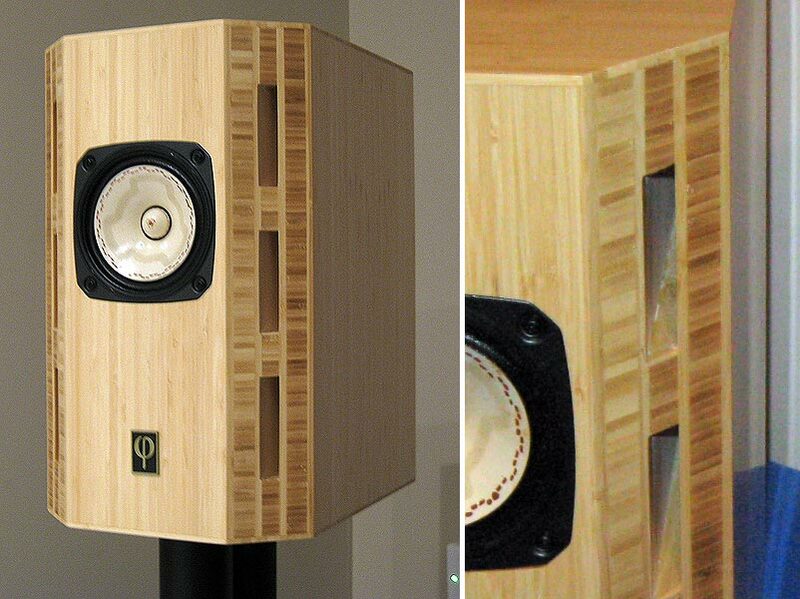 Finished versions of the miniOnken with planet10-hifi modified drivers (also available separately) can be special ordered and flat-paks are under development. A diyAudio thread on a Fonken build.